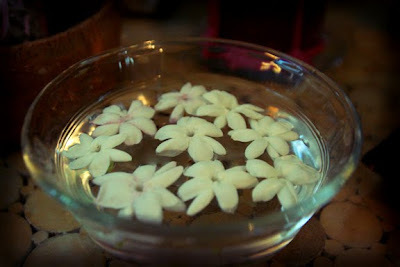 These are the jasmine flowers that drop off after they've bloomed. Jasmine blooms at night and has the most amazing scent. Someday, I want to live somewhere, where I can have a hedge of jasmine. That means it needs to be warm enough year round for the plant to stay outside and be planted in the earth. A hedge of jasmine. I can smell it just thinking about it. So after the jasmine blooms, the flowers drop off about 24 hours later. When I remember, I will gather them and place them in some water and bring them inside. The scent lingers with them for another day or so. The buddha altar has become the place to set the jasmine flowers. It looks like an offering sitting on the altar. And I suppose it is. An offering of the beauty we get to experience, thanks to the universe.